Chicken and Rice. There are so many variations of this dish. You have the Chinese version which consists of plain poached chicken with plain white rice. I never understood why this was so popular. I guess it is highly dependent on the ginger condiment. 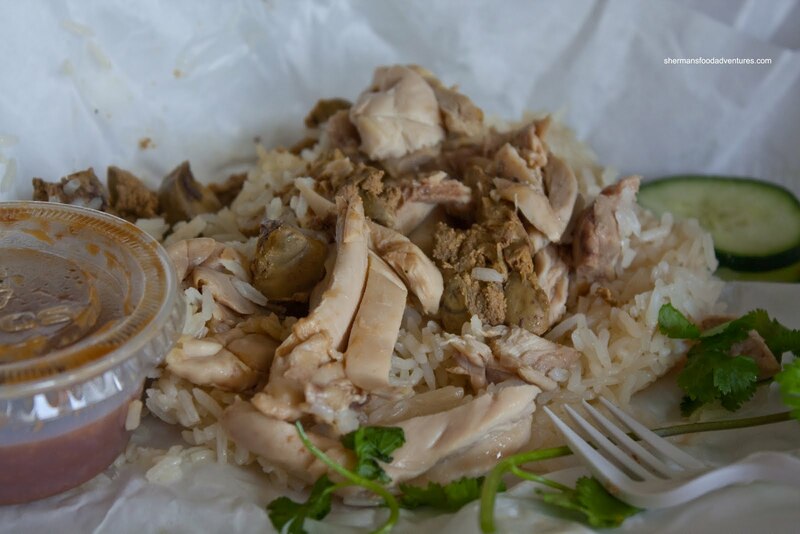 Then you have the ever-so-popular Singaporean Hainanese chicken. 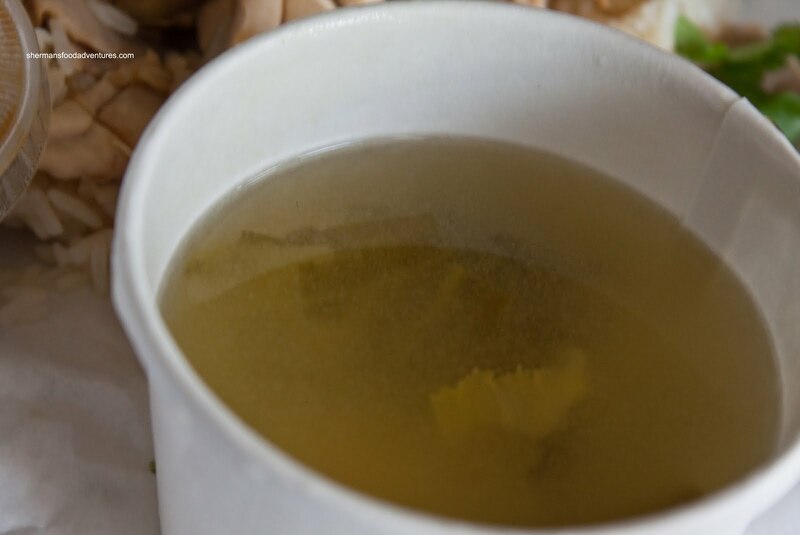 It is also poached chicken; yet in a flavourful broth which is also used in the rice along with chicken fat. I really like this one. Then there is the Thai version which is very similar except for the accompanying sauce. This is where Nong's Khao Man Gai comes into play. 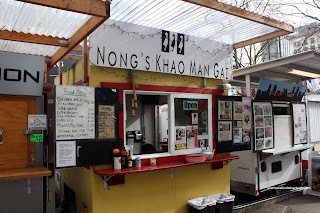 A tiny food cart among the many near the corner of 10th & Alder in Portland, it serves up only one dish - Thai chicken and rice. The cart owner is from Thailand and used to work at Pok Pok before opening up her chicken & rice cart. Last year, I attempted to snag an order of this famous grub; but was thwarted by supply and demand. You see, the demand was more than the supply. Yup, when they sell out, the cart closes. I was too late. This time around, I had a plan. I was there nice and early at 10:30am. Yes, a bit early for lunch; but I would get my prize. Indeed it was like a prize or gift will you. Wrapped in paper like a present, it opens up with the waft of ginger and the nuttiness of cooked rice. The chicken itself is nothing much to look at and to taste really. Neither is the rice. It is chewy and fragrant though. The thing that brings it all together is the sauce. Oh that sauce. A combination of ginger, garlic, vinegar, peanut, sweet chili and other things I couldn't figure out made the chicken & rice sing. I kept heaping spoonfuls of it into my mouth. It is as good as people say. Go get some. Sherman, one day you are going to have to go to Papeete Tahiti to les roulottes.... these food carts are some of the best we've ever encountered. They come out every night and are so wonderful with nightly polynesian shows and are right on the waterfront gardens. Thanks for the tip, now I have another place to try next time!